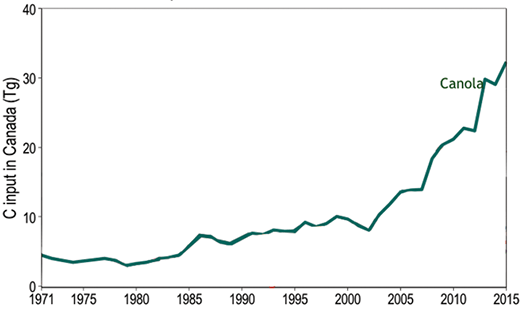 Canada’s much-increased soil carbon sequestration since 2005 has been driven largely by the increase in area and yield of canola. As growers have been increasing yields and diversifying rotations to crops such as canola, carbon sequestration and soil organic carbon levels (SOC) have been increasing significantly over the past few years. A recent study conducted by researchers with Agriculture and Agri-Food Canada (AAFC) focused on quantifying carbon (C) inputs and SOC sequestration for agriculture cropping systems. “Based on a modelling approach, our results show that increasing crop yields and adopting crop mixes that input proportionately more below-ground C, such as canola and oat, showed additional opportunity to sequester SOC,” explains Brian McConkey, research scientist with AAFC in Swift Current, Saskatchewan. 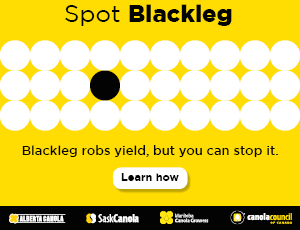 This is because canola has more roots and residue than other crops. Until this study, researchers knew there was a large effect but hadn’t really been able to quantify the SOC from increasing crop yield. To do this, they had to include all changes to C inputs including manure additions and removal of crop residues for bedding and fodder. These results add confidence to the project estimates, which were often missing from previous calculations. My dad experimented with zero tillage in the early 1980s, before glyphosate was cheap. He was determined to find a way to be successful and 1997 was our last year for tillage. I will apply anhydrous ammonia in the fall with 3/4” openers on 12” spacing, but we’re never tilling for the sake of tillage. Zero tillage has been a win for us. It has many benefits, starting with less work and less fuel used. It means our soils have more moisture, which makes a big difference in a dry spring like we had in 2018. Somewhere along the way my dad heard that every tillage pass loses the equivalent of about 1” of moisture. Zero tillage means less wind erosion. We had so much soil blowing around in the 1980s, we had fields where we could drive straight off the road and into the field because the ditches were full of our topsoil. You want to talk sustainability? It’s hard to be sustainable when your topsoil is gone. Finally, and this will seem counter to the culture of tillage, I believe zero tillage can also have benefits in a really wet year. With good soil structure that you get with zero tillage, these fields hold up machinery better than a tilled field in wet conditions. I don’t ever want to go back to tillage, but tools like glyphosate to control weeds help make zero tillage possible for us. I hope people recognize the possible bigger damage that could be done to the environment if tools like glyphosate are banned. Donna Fleury, P.Ag., is an agricultural freelance writer from Millarville, Alta.